Our organization has gained the popularity as a trustworthy manufacturer and supplier of Pipes Fittings which is full of distinct attributes. These are manufactured using high grade material of construction like stainless steel and others which are acquired from reliable vendors. The range of Pipe fittings includes following products. 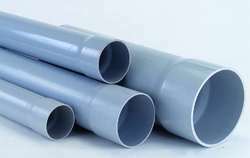 We are instrumental in offering PVC SWR Pipe which is designed in accordance with ISI 14735 Standards. SWR which is an acronym for soil, waste rain is available in different sizes like 63mm, 75mm, 90mm & 110mm size in gray color. The O-ring seal socket is used for creating a joint. Our array is broadly used in rural as well as an urban sector for agriculture purpose. Also, work as the best alternate to the asbestos cement and cast iron pipes. 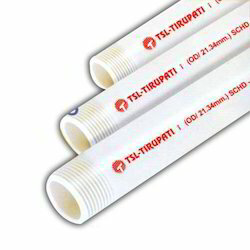 Our customers can avail from us an exhaustive range of Tirupati Superflow PVC Pipes which is fabricated particularly for agricultural purposes. It is manufactured using advanced machinery and superior raw material. The pipes are available in different discharge capacities which cover small to large areas and are appropriate for use on every type of fields. Our range finds application in many industries like agriculture, residential, industrial, hotel, resorts, public & government enterprises, golf links and race courses. We offer a wide range of Protector Well Casings Screens pipes are specially designed to ensure clean, clear water from bore wells, whether shallow or deep The Protector range is manufactured as per IS 12818 and DIN 4925 standards. Like other pipes. These Casing pipes are easy to install The threaded ends ensure that the pipes can be screwed onto each other without the use of cement or adhesives. 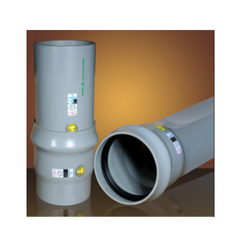 The PVC Protector Casings have several advantages over conventional steel well casings. Dimensions of 'CS' Casing Pipes depend on well depth. Ring Fit UPVC Pipe with the rubber ring joint are specially designed for higher diameter pipes and no solvent cement is required, which leads to easy installation & leak proof joint. The rubber jointed pipes are very easy and convenient for installation. The rubber ring helps to absorb the line's expansion and contraction leaving the seal intact in case of extreme temperature variation. Certain deflection up to say 2% of each joint due to shifting of soil, land contour etc. can be easily absorbed by the rubber ring joint. Note: Ring fit pipes are manufactured in the range of 63 mm to 400 mm diameter in 4, 6,8 and 10 kg /cm2working pressure classes. 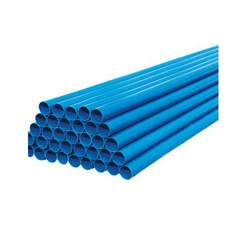 We are the leading supplier of PVC Blue Casing Pipes made from high quality material at competitive prices.